Wha? You may be asking yourself, ‘why would I want to go to Woonsocket?’ Be kind. Or you may be asking yourself, ‘There’s a train to Woonsocket?’ Well there are train tracks, and freight trains go through there, you could jump on a box car on Allens Avenue and hitch a ride to Woonsocket. But as fun as that may be, that’s not what I’m talking about. I’m talking about an actual train, for people, with seats and stuff. There’s been chatter about passenger service from Providence to Woonsocket and perhaps on to Worcester for a while (maybe since service was suspended in 1960). It may be true that many of us here in Providence have no need to go to Woonsocket, but in a healthy metropolitan environment, people from Woonsocket and points between here and there would certainly want to be coming to Providence for work and recreation. The current administration in Washington would probably rather give us money to add four or five lanes to Route 146 before providing funds for commuter rail service, however one way or another we’ll have a new administration in Washington in about 13 months. 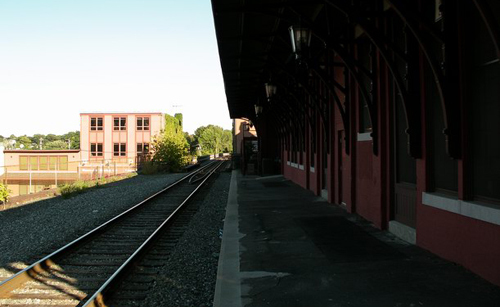 So the time to plan for rail service is now, and that is what the City of Woonsocket is doing. Rhode Island is the most urban state in the country, we are a small state with limited land and limited resources. It is a no-brainer that we should be expanding public transit options to move people around the state and relieve congestion on our state’s (crumbling) roads. Potentially, Woonsocket service could continue south through Providence to the new station at T.F. Green airport, supplementing MBTA service to that station. Great stuff PDX…Woonsocket-Providence rail service would provide a welcomed connection for those that live or work in either city. It will help folks stay close enough to the Providence hub without dealing with the gentrification going on in the Prov area. The grass-roots arts district that’s been developing in Woonsocket has some wonderful live/work mill loft space available with more space on the way. It is absolutely ridiculous that Woonsocket doesn’t have a train to Providence. How can Woonsocket possibly turn the corner without that link to state capital? I live in Woonsocket and I went down to meet a friend in Providence recently and he said to me “It’s crazy that I can go from Belmont Massachusetts to Providence via public transit easier than you can from Woony to Provi”. It is crazy and this should be priority one for the town because the more people see Woonsocket as a connected town (as opposed to an isolated one), the higher the prop values, the more taxes, the better schools, etc. I too, am a big proponent of this service. This new rail line should basically use the P&W freight line between Woonsocket and Quonset. 2 trains sets – 1 on each end with stops at the airport and Providence station. Phase 1 would be simple: rehab the Woonsocket station and use 1 train to shuttle back and forth between the 2 cities. From there, new stations could be built at Quonset, the Lincoln/Cumberland area and Cranston. Once those are done, 2 trains; one starting at each end, could run the route back and forth thoughout the day. I am totally for this idea! My family and I live in Woonsocket and my husband works at the airport, so this would be ideal for his commute! I know a lot of people in my area that would utilize the train. Makes so much sense! I know when I moved into Woonsocket in 2006 there was a rumor flying around that soon we would have a T station into Boston, basically connecting Woon. to the Franklin station I guess. But the train going into Prov. is a great idea also.